No Cake Wrecks here. In the mood for a very good doughnut? 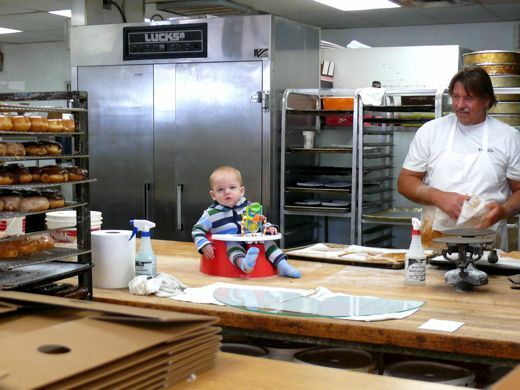 I was indulging a wish for a friend, and Aiden, (he's the baker, man,) recommended the cinnamon twist. He sees it all, so I knew I could rely on his suggestion. Thanks, and remember to tell 'em mark it with a B! I wonder if thinking my camera is fatigued is like a self-fulfilling prophesy? Of the one hundred and sixty-one photographs I have taken this week, there are only a few that sort of inspire me to share them... somewhat reluctantly. So, is it the camera, or am I simply not trying hard enough? Here is Temple. Named for Temple Grandin, a favorite scientist here at the Bird House. Unfortunately, our Temple is not a womanly chicken-hen, but a manly he-chicken, and a cocky one too. He drew the shortest straw this week, and I finally summoned the courage to take him on a country drive. It broke my heart. A little bit. I did try to work with him, to be his pal, but he kept escalating the rumbles, with children, with the other chickens, with me! Even our dear neighbors, who love and respect all creatures great and feathered, decided he might not be a healthy addition to their flock. They chose wisely. It is hard to be a farmer, a soft-hearted suburban farmer. On the way over to the feed store-happy farm, Temple was silent and still. He slumped on the bottom of the cage, with his mop top drooped down from his prone body, and I thought he's dead! I had to pull over. Check his pulse. He was so forlorn and dejected. So. Yeah, I was crying and driving, and I left the feed store crying too. Zelda would like to say, "Good riddance, and why didn't you take the other two knuckle-heads with you?" Zoltar is a small and affectionate knuckle-headed rooster, and if he can calm down now that his rival is gone, then I will be happy to keep him here. Tesla, is as big as Temple, but far less capable of being a menacing rooster, because of his special situation. Have I mentioned Tesla's "special situation?" 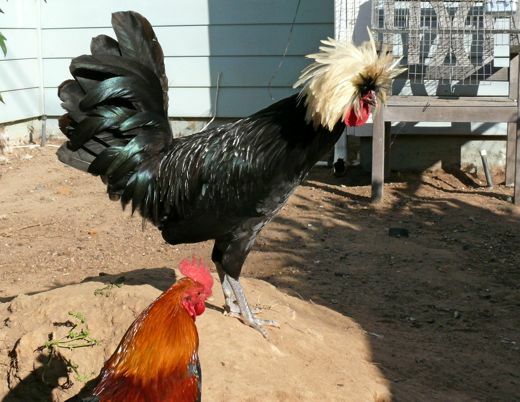 Nikola Tesla is a Polish rooster, and he has chicken scoliosis. His spine is twisted, so badly that he looks as though his head is on the far end of his right shoulder. He can not look up, which makes drinking and eating a challenge. It's hard being a soft-hearted suburban farmer, and I know he would not last long on a real farm. He seems happy enough here, and though his condition may be his eventual undoing, until I see him suffering, he will have our compassionate affection. 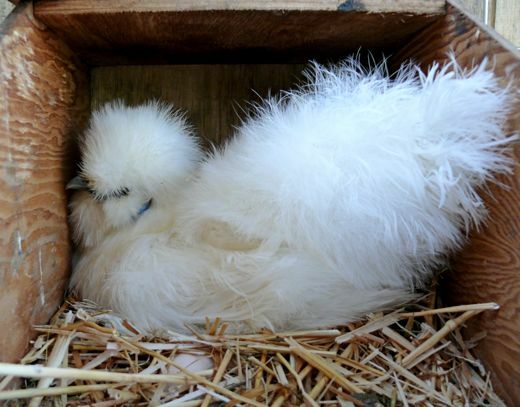 So, Zelda, you Silkie princess, for now, your companions are Lady Betty Orpington, Lady Puff of Henness, Zoltar il Magnifico, and Tesla the Defender. Trudy is gone. I have avoided this sad update for some time. There was no sign of distress, no indication of illness. She was simply on the floor of the shark cage, and gone. There was only one way to tell Princess Trudy from her sister, Zelda: Trudy was the only one that would come to me when I called the chicas. Trudy and I were friends. It may have had something to do with her learning that I shared caterpillars, but she and Betty were the only ones that came when called by name. So, yes, more crying there. We had a lovely funeral, October 30th. On bed of rose petals we laid sweet Trudy to rest. Maria is still on the mend. Last night was not good. She had the green light to return to school, but now I worry that the long day has been too much. Today, we are home, so I will monitor her closely, and hope that she continues to heal. Funny note: She came home with two inches of homework, and was elated. Elated! She proudly announced her homework situation to all, and smiled broadly. Diligently and happily, she has been tracing, cutting, gluing, coloring her way through every blessed page.<------------------Not a gene, habit, or attitude she inherited from her momma. Alex invited Team Paradox, our favorite robotics team ever, over for a little float construction session. The holiday parade is coming up and the Paradoxians have plans! I hope everyone is ready for robotics, for FIRST, for Kick-off (only 58 days away! ), for all it takes to be spirited and to inspire math, science, and engineering! Oh... just noticed the time. Gee. I am a slow typist. Other news will have to wait. Time to greet the brand new day, away from the computer. If you have a moment, share your news... what's going on? A lovely round up of chicken and people news. And thank you for insight into the revolving denizens at the home of a suburban farmer. You and your family enjoy a lovely weekend. Three of my oldest and dearest blogging friends, all together here... what a lovely treat for me! Thank you Anne, Beverly, and Tracy. I feel blessed to know you three kind and lovely women. ((((((Big Hugs)))) indeed... to reach around the world.